Clips from all of our previous shows. Please donate to keep these shows going. If you are viewing some of the older flash videos on a smartphone you may need to use the app skyfire to view. October 10th, 2018: Hurricane Michael hits Panama City & Mexico Beach, Florida causing very heavy damage. We were live filming in the affected areas with our most dramatic footage to date, with violent eyewall winds & the eye as 155mph Michael hits. (Watch 1hr 6min) or just eyewall & eye version. Watch (14min). September 14th, 2018: Hurricane Florence makes landfall in North Carolina. We covered it the night before discussing what could happen followed by coverage the day Florence made landfall. Watch (48min). September 20th, 2017: Hurricane Maria hits Puerto Rico. Jim Williams was live the night before with track statistics and discussion about landfall. Watch (12min). September 18th, 2017: Hurricane Maria hits the island nation of Dominica as a category five with 160mph winds. Jim Williams discusses what could happen while showing radars, satellite imagery and the Hurrtrak program statistics. Watch (26min). September 11th-14th, 2017: Hurricane Irma aftermath coverage as seen on HurricaneCity.tv. Watch (30min). September 10th, 2017: Hurricane Irma hits South Florida. Video, cams, radars, satellite and news reports as it happened. Watch (57min). September 6th, 2017: Hurricane Irma hits the N.E. Caribbean with 185mph winds. Bill Phillips & Donald Midgette recorded events as they happened with cams, video, radars, radio etc; About half way through this video you will hear some interesting ham radio from a boater in St. Thomas, VI. Watch (28min). August 25th, 2017: As it happened, major Hurricane Harvey hits Texas with high winds near Corpus Christi followed by major flooding in the Houston area. Some very dramatic video of the winds coming in to Rockport, Texas from storm chasers. Watch (1hr 3min). August 12th, 2017: Jim Williams' mid season hurricane report. Discusses season thus far and who are the most prolific tweeters. Watch (1hr 37min). June 1st, 2017: Hurricane Season Kickoff Show with Jim Williams & Bill Phillips talking about upcoming season. Topics include latest NHC products, names on list, hurricane preparation, hurricane forecasts and old hurricane movies. Watch (1hr 46min). April 3rd, 2017: Jim Williams is the guest on WeatherBrains show talking about upcoming hurricane season. Watch (1hr 35min). November 30th, 2016: End of hurricane season show; Five of the biggest stories of the hurricane season. Watch (1hr 41min). October 13th, 2016: Major Hurricane Nicole hits Bermuda with the eye passing right over. You will see recordings from HurricaneCity.tv of radar, cams, weather obs, news/pictures and videos as it happened. Watch the timeline (31min). October 4th-9th, 2016: Hurricane Matthew hits Haiti, east Cuba, western Bahamas, N.E. FL coast, Georgia, South Carolina, North Carolina and Virginia. A video timeline of events as they happened in each location as seen on HurricaneCity.tv. Watch (44min). October 7th, 2016: Hurricane Matthew's western eyewall hits N.E. Florida. Jim Williams live video streamed on HurricaneCity.tv with host Bill Phillips providing updates. Watch (21min). Blizzard in Washington DC, New York and Philadelphia captured on our live stream on January 23rd, 2016. Webcams, scanner audio and news as it happened, recorded for future reference. Watch (6min). The Atlantic Hurricane Season ended on November 30th with the hardest hit area being the Central Bahamas. Watch (1hr 39min). Jim Williams' end of season broadcast recorded on November 30th as he discusses the forecasting challenges. August 29th, 2015 discussion on dissipated Tropical Storm Erika. The media hype, models' forecasting errors, calls & emails. Watch (2hr 12min). On July 1st, 2015 Jim Williams and Bill Phillips talk about the 5 things they love & hate about Facebook. Watch (1hr 38min). June 1st, 2015: Hurricane Season Kickoff Show with Jim Williams and Bill Phillips. Jim is forced to wear a chicken suit after none of his top 5 locations were affected in 2014. Watch (1hr 28min). January 6th, 2015: Jim Williams on the state of Twitter and how it affects hurricane information. Watch (50min). After going through hours of recorded video I edited down the most interesting moments of Hurricane Gonzalo hitting Bermuda from October 17th, 2014. After editing down to 36 minutes the program would not produce the video without crashing so I did a screen capture of the program with Ustream so it is a bit pixelated. Watch as we show cams, radar, news, and Hurricane Watch Net audio as Gonzalo hits. Hurricane Arthur hit the outer banks of North Carolina during the early morning hours on July 4th . As Hurricane Arthur made landfall some of the most interesting moments were recorded live on HurricaneCity.tv. On the recording (14min) you will see hurricane Arthur from the eyes of storm chasers, webcams and television as it happened. In May of 2014 I was on the panel for a Florida Key's Hurricane seminar to discuss the message & how the public gets info. I found myself defending amateur hurricane forecasting, but held my own. It was 2 hours, edited down to 15 min. Watch (15min). Storm chaser Jim Edds was in the Philippines filming Typhoon Haiyan on November 8th, 2013 and talked about it with Jay Leno on the Tonight Show (8min) on November 28th. A massive tornado roared near & over parts of El Reno, Oklahoma in May of 2013. Unfortunately 3 very experienced storm chasers lost their lives in this unpredictable super cell. Tim and Paul Samaras' memorial service was held a week later and filmed by a local TV station aired live on the internet and we recorded most of this touching service. Watch (46min). Bill Phillips was streaming live on HurricaneCity.tv as the Moore Oklahoma tornado moved through on May 19th, 2013. He recorded several different media sources live as the massive tornado devastated the town from beginning to end. Watch (1hr 13min). On the February 1st, 2013 Weather and the Media Show (1hr 8min) my guest was Chris Kridler, author of the book Funnel Vision. This book takes you into the heart of Tornado Alley and tells the story of tornado researcher Jack Andreas who gets involved with Judy Hale, a Kansas photographer, and her sister Shannon. This book has a lot of ups and downs with some real surprises and actually shocking towards the end, definitely a must read. Chris also discussed her new book called "Tornado Pinball" where a manned probe is put in the path of a tornado. The Atlantic hurricane season ended on November 30th, 2012 with 19 named storms. On the end of hurricane season broadcast we discussed Sandy and the other big story this season, Hurricane Isaac. Why was there no hurricane warning? Was this the worst ever for the N.E.? Is global warming and sea level rise to blame? Watch (2hr 34min) the entire show. Hurricane Sandy telethon recorded from the networks in the aftermath of Sandy. Watch (1hr 1min). Hurricane Sandy hits New Jersey on October 29th, 2012. The Hurricane Warning Show (58min) is a basic timeline of events as they took place with models, radar, satellite, storm chasers, cams, weather observations and news reports from several different news sources. Hurricane Isaac hit Louisiana hard as a category 1 hurricane on August 29th and 30th, 2012, causing flooding in many areas. The Hurricane Warning Show (39min) recorded during landfall runs about 40min,please allow a minute for the video to load . You will see assorted webcams,news stories of survival,damage and live chaser video as it all happened but remember the live encoding bit rate does cause some pixelization and blurred animations but overall a good timeline of what happened. On the Hurricane Season Kickoff Show, Jim Williams makes city predictions from Virginia Beach on June 1st, 2012. Watch (2hr 18min). On the May 1st, 2012 edition of the Weather and the Media Show my guest was James Spann, Chief Meteorologist for ABC 33/40 in Alabama, via Skype. We discussed his career, his emotional feelings on the Tuscaloosa Alabama tornadoes in 2011 and much more. Watch (1hr 12min). Weather and the Media Show for February 1st, 2012. My guest was Ken Kaye, a veteran journalist, having worked more than 30 years as a reporter, editor and columnist. For 18 years he covered the latest news from the hurricane center as well as the latest science news regarding hurricanes for South Florida's Sun Sentinel. I asked him about who he thinks will be the next director at the NHC, the continued active hurricane seasons, global warming, what it is like to be a hurricane reporter and who is his favorite local weather person. Watch (1hr 7min). End of hurricane season broadcast on November 30th. South Florida was not impacted by a named storm in 2011 so Jim Williams wears a hot dog suit as per viewers' wishes. Watch (2hr 5min). November 1st, 2011 edition of the Weather and the Media Show. Veteran storm chaser Richard Horodner talks about some of his very dangerous hurricane chases before mobile radar was available. Watch (2hr 10min). We recorded the most interesting moments of Irene on HurricaneCity.tv throughout its journey from the Bahamas through landfall in New Jersey on the Hurricane Warning Show from Aug 25th through the 28th. The archive starts with Bahamas Radio Network (hard to hear at times) via ham radio for about the first 12 minutes and then shifts to North Carolina and Virginia with webcams and live chaser video. You will see a sprinkling of local news as well as the VOIP spotter network and Hurricane Watch Net audio along with radar shots. The video wraps with landfall in the N.E. with local news, observer reports and Fred Furneaux's live mobile cam showing trees down on Long Island. We ended the broadcast before the major flooding was realized in upstate New York and Vermont. Watch (1hr 12min). Weather and the Media Show for August 1st, 2011. We discussed the future of Emily and the challenges involved in chasing / filming hurricanes with Jim Leonard. Watch (1hr 12 min). Hurricane Season Kickoff Show on June 1st, 2011. Jim released his top 20 cities and islands that he thinks will be hit by named storms this year. 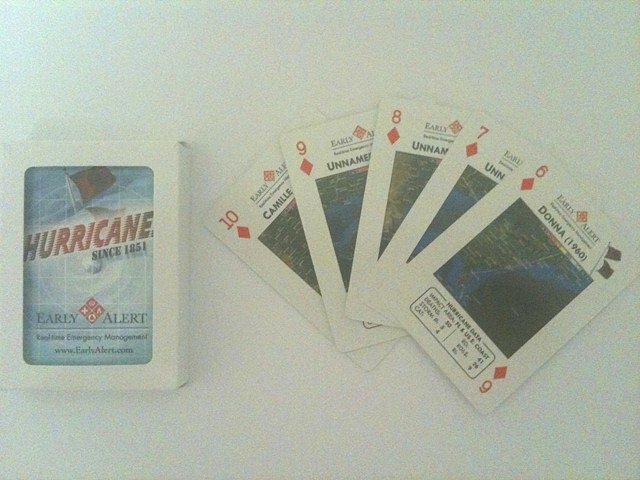 There were quite a few giveaways for callers that stumped the panel courtesy of Early Alert, Inc. We gave away Siberian Ice as well as hurricane playing cards which have historical hurricanes on the back of each card with statistics. We also gave away some laminated hurricane tracking charts courtesy of Maptrax. Watch (2hr 31min). On May 18th-20th, 2011 Bill and I attended the Florida Governor's Hurricane Conference in Fort Lauderdale. Here are some of our live recordings from the workshops, General Session and interviews. Wednesday, May 18th: NHC Director Bill Read gives speech about past hurricane season with slide presentation. Watch. Wednesday, May 18th: Same speech taken from iPhone showing different angles. Watch. Thurs, May 19th: Interview with Dr. William Gray from Colorado State on his career, forecasting and global warming. Watch (25min). Thursday, May 19th: NHC public affairs officer Dennis Feltgen talks about media access. Did you know that TV stations pick numbers out of a hat to know when they can do interviews? Watch. Thursday, May 19th: Views of convention center and Dr. Gray speech. Watch. Thursday, May 19th: Craig Setzer, CBS Miami meteorologist, talks about newscast demographics. Did you know on a typical Wednesday 11pm newscast 73% of viewers are women? Craig also explains forecasting graphics (recorded via iPhone). Watch. Friday, May 20th: Dr. William Gray workshop explaining his forecast techniques. Watch. Friday, May 20th: Phil Klotzbach discusses the forecast for 2011. Watch. On April 27th, 2011 a tornado outbreak devastated many areas in the southeast US. On HurricaneCity.tv we were monitoring events as they happened and recorded the most dramatic moments from local TV. This 27 minute video includes many different views of the tornadoes in Alabama & Georgia and the great job forecasters did in warning residents. National coverage follows with aftermath footage from the affected areas. On February 2nd, 2011 Cyclone Yasi pounded small towns just south of Cairns, Australia. Bill Phillips was recording call in's to radio stations on HurricaneCity.tv the night Yasi hit. Some of the eyewitness reports give you the chills as people describe their homes coming apart. Watch (13min). On February 1st, 2011 the Midwest was hit hard by a major winter storm. On HurricaneCity.tv we recorded local TV from Oklahoma City and Chicago, two of the hardest hit areas. On this recording (6min) you will see a few of the most interesting moments of the blizzard. On February 1st I had my quarterly edition of the Weather and the Media Show talking about the blizzard. Guest Kathy Wendolkowski talks about researching old weather data from ships on OldWeather.org. Jim talks about the sizes of past hurricanes and the adjusted city rankings. Access the show here (2hr 25min). On December 26th, 2010 a blizzard affected areas of the N.E. with heavy snowfall. Scanner audio of the difficulties by emergency workers was recorded on HurricaneCity.tv during the storm with news clips from the affected areas. Watch (9min). We recorded events as Hurricane Richard hits Belize on October 24th, 2010, such as Hurricane Watch Net audio and calls to radio stations. Watch the 11 min clip and see how a cat 1 hurricane can cause a lot of problems. On the August 2010 Weather and the Media Show guest Christopher Hollis from TropicalAtlantic.com talks about how he extracts data from recon/NHC and produces the web content many trackers use. Watch (46min). On March 16th, 2010 Cyclone Tomas affected the Fiji Islands in the Pacific. On HurricaneCity.tv during its passage we were streaming live radio, satellite, news and a nearby webcam. Here is a 9min clip showing what was broadcast during Tomas. Jim Williams attended Jim Leonard's storm chasing gathering in the Florida Keys on March 20th, 2010. In this 13min video you will see the chasers and hurricane people that attended. In early February of 2010 Washington DC and surrounding areas had record snowfall followed by a rare snow event in the south. This snow video (15min) shows the problems emergency personnel run into during heavy snow calling in for help on their radios. In the weeks following the Haiti earthquake on January 12th, 2010, many media outlets were live in the affected areas. As usual we recorded clips from the media of the most moving stories of the aftermath. Most of this footage is from CNN which did an outstanding job covering the earthquake. In this video (34min) you will see earthquake video as it happened, rescues and even 15 second clips of every performance of the Haiti Telethon. On January 30th, 2010 a rare snow storm affected the Virginia Beach area. Bill Phillips recorded the most interesting moments of the event. Watch (4min). Bill Phillips was streaming media content on Ida from his area in Virginia Beach on Hurricane TV from November 11th through the 13th and recorded the event. In this video (10min) you will see local news of the worst conditions over the three day period. Dramatic emergency scanner audio was recorded along with webcams from Virginia Beach. 2009 Governor's Hurricane Conference video collage from Fort Lauderdale. Watch (31min). The tornado touchdown in Murfreesboro, Tennessee on April 10th, 2009 was captured on our live feed. Watch (8min) how local forecasters save lives while the tornado moves through town. On March 3rd Jim Williams of HurricaneCity.com was the guest on the "Center of Circulation" show with Michael Moss & Charlie Wilson. The interview lasted about 25 minutes talking about the website & city database with some very interesting city comparisons. Listen. On the February 2009 Weather and the Media Show our guest was Cory Pesaturo, hurricane statistician and accordion musician. Hanna from the CaneTalk message board was in the studio for this interview. Watch (40 min). On Saturday, November 1st, 2008, we had our quarterly show called "Weather and the Media" (1hr 8min). You will hear my interview with NHC director Bill Read with questions such as what changes have you made at NHC? Would you still track hurricanes if you were not in the business? Also, his Texas connections in dealing with Hurricane Ike & Dolly. I also passed along some interesting hurricane statistics. On October 16th, 2008 we recorded some very amusing telephone calls (12:30) to WSTA radio in St. Croix as Omar passed by. September 13th, 2008: The story of Hurricane Ike & how it all went down. The video archive (1hr 40min) has the "best of" footage from local and national networks with my updates showing recon reports, 3-D radar animations, storm chaser video, calls to observers and ham radio audio. All of the bloopers seen on TV, such as the person in the bear suit walking down the beach, Geraldo getting smacked by a wave and even a streaker running behind a TWC reporter, as well as Mike Seidel being flung into the bushes, are all on here. Archive video of Hurricane Gustav making landfall in Louisiana. In this video (21min) we captured some of the most interesting moments of landfall, including the dramatic overtopping of the levees as seen on the networks. On July 23rd, 2008 Hurricane Dolly hit southern Texas as a category two hurricane. We recorded media coverage, radars, recon reports, ham radio, webcams and screen captures using the Hurrtrak program. Watch (1hr 3min). On April 27th, 2008 an EF3 Tornado with winds up to 167mph ripped through Suffolk, Virginia. We recorded local news coverage showing videos that viewers sent in. Watch (6min). On Friday night, March 14th, 2008, Atlanta, Georgia was hit by an EF2 tornado with winds up to 135mph. We recorded scanner audio of Atlanta firefighters and Georgia search and rescue teams looking for survivors. If you have never heard these people in action you must listen to this clip. They have dangerous jobs as you will hear one firefighter injured while working in a collapsed building. This clip is about 20 min long. Watch. A blizzard affected most of Ohio on Saturday March 8th, 2008. We recorded the most interesting webcam shots along with radio & scanner feeds. On this video you will see Snow plows in action in Columbus, a vehicle disabled on a major highway & hear Police & fire rescue personnel getting stuck in snow. Watch this video of the most significant snow storm to affect Columbus, Ohio in 30 years here (23min). On February 5th, 2008, during the Super Tuesday elections, a tornado outbreak in the south killed over 50 people. We captured local news from Memphis, Tennessee of local meteorologists showing zoomed in radars & reading warnings as it was going down. Please excuse the lines running through the screen & bad resolution, the video card was shot as this event was happening. Watch the 11 min video here. On November 24th a wildfire destroyed over 50 homes in Malibu, California. On our live feed we recorded news clips of the most interesting video feeds from the affected areas. Some of this video is raw feed video from news copters filming & describing all of different aircraft participating in putting out the fires. Watch (24min). On November 15th, 2007 Cyclone Sidr hit Bangladesh. We edited down news footage from sources near the affected areas before, during & after Sidr hit. Watch. On November 3rd Subtropical Storm Noel affected Nova Scotia with high winds. We recorded radio from the affected areas during the morning as Noel passed through while monitoring a live streaming cam from Nova Scotia. Watch. In this short video you will see clips from national news outlets with the most interesting video from the California fires of October 2007. Watch (approx. 7 min). Ever wonder what typhoon media coverage looks like? We captured live media from Japan as Typhoon Fitow hits as a category one on September 6th. Watch (approx. 7 min). In this Dean video (56min) you will see animated radar at landfall, satellite feeds from local pool reporters doing off camera stuff and local radio stations in Belize taking calls from worried residents as the wind is howling in the background. Video wraps up with national media coverage in the aftermath. The first video from our Hurricane Warning Show is Hurricane Dean brushing south of Jamaica. In this video (43min) you will see satellite images, radar shots, news coverage and residents calling in to radio stations describing the damage. On the morning of August 21st Hurricane Dean made landfall as a category five hurricane in the southern Yucatan Peninsula. Ever wonder what TV coverage looks like when a hurricane hits a country like Oman? We recorded some live content from Oman TV as Cyclone Gonu affected the area on June 6th. Watch (13min). Towards the end a local weatherman does his best Max Mayfield imitation. A tornado outbreak affected the Midwest on May 4th, 5th & 6th. During this event we captured live local and national TV from the affected areas, mostly in Greensburg, Kansas. In this video (14min) you will see a radar animation and NOAA weather radio as the tornado hits, followed by media coverage. Towards the end of the video, storm chasers show dramatic footage of tornadoes during this outbreak with one tornado tearing apart a structure. A major winter storm affected the Midwest and the Northeast on Valentine's Day 2007. In this video (6min) you will see how the media covered this event and that spectacular video of the semi-trailer slamming into a parked car. In February 2007 new NHC director Bill Proenza discusses hurricane threats, running NHC, how much does one get paid and how does one get a job at the NHC. Listen (1hr 18min). On January 13th through 15th a large ice & sleet storm affected Texas, Oklahoma, Kansas, Missouri and Illinois. During our live stream of this event, we recorded the most interesting moments with local news, cam shots, radio feeds and national news coverage. This video is about 28min. I got in touch with one of my observers, Glen, from Bermuda Weather. He runs the Bermuda Shorts webcam. We talked about what happened during Hurricane Florence on September 11th, 2006. Watch (8min). In early June I had HurricaneCity contributor Bill Phillips down to visit. We traveled to Lake Okeechobee & the Florida Keys to visit the Key West NWS. Check out the page right here. In April 2006, legendary storm chaser Jim Leonard takes calls from fans & talks storm chasing. Listen (38min). On May 20th we held the first HurricaneCity gathering. The gathering took place in Fort Walton Beach, FL and afterwards a few of us traveled west to the Katrina zone. Lots of video and pictures right here. As Wilma made landfall in South Florida, we captured dramatic live video from our towercam as well as radar, satellite imagery, observations & TV coverage as it happened. Watch here (1hr 13min). Hurricane Wilma makes landfall in the Yucatan Peninsula as a category four hurricane. Watch (48min). On September 24th, 2005 Hurricane Rita made landfall in SW Louisiana. Watch (1hr 22min) as you will see radars, television feeds, observer call in's and storm chaser reports. On August 29th, 2005 Hurricane Katrina made landfall in SE Louisiana & Mississippi. Watch this tremendous video (1hr 34min) of live radar, chaser video and news reports. On August 25th, 2005 Hurricane Katrina made landfall in South Florida. Watch this video (1hr 20min) of live radar, chaser video and news reports. On July 17th & 18th, Hurricane Emily hits the Yucatan Peninsula. Watch (1hr 13min) the "Hurricane Warning Show" as it makes landfall. Maps, recon reports, radar, satellite imagery, callers and TV reports. Before the 2005 hurricane season started, I interviewed Pamela Crawford, author of "Stormscaping". In this interview we discuss what trees hold up better than others in hurricanes. You can watch it here (18min) and you can visit the website here. This page has video & pictures from the 2005 National Hurricane Conference taken in March 2005. Watch (30min) HurricaneCity coverage of Hurricane Jeanne. On September 25th, 2004 Hurricane Jeanne hits Martin & St. Lucie counties in Florida. Watch this HurricaneCity presentation as it all goes down with Ross from SunCam.tv in field. Watch (1hr 17min) part 1 of the Hurricane Warning Show on Hurricane Ivan with observers, chasers & Santa Rosa county commissioner as eye approaches. Watch (32min) part 2 of the Hurricane Warning Show on Hurricane Ivan. Mark Sudduth from "HurricaneTrack.com" calls in with his cam streaming. Hurricane Charley hits Orlando and Disney World as a category 1 hurricane in 2004. Jim interviews observer in Disney World as Charley moves through. Audio only (15min). 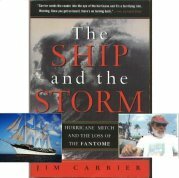 On July 26th, 2004 Jim interviews Jim Carrier, author of "The Ship and the Storm", the story of Hurricane Mitch from 1998 & the Fantome. This interview gives insight into the disappearance of the ship & it's crew and the forecasting headaches this hurricane caused. Watch (26min). On November 12th, 2003 guest Jerry Jarrell, former NHC director, on the Barometer Bob show. Listen (43min). In 2003 Jim Williams interviews Neil Lareau on Mount Washington as gusts over 100mph buffet the area. Listen (10min). Listen (14min) to Hurricane Watch Net ham radio reports & Jim Williams interviewing Bermuda observers during Hurricane Fabian on September 5th. Classic interview with Dr. Robert Sheets, former NHC director from 2003, during the hurricane season when Erika was starting to form. Barometer Bob show interview about career at NHC, how does recon work, building NHC and forecasting Andrew. Listen (45min). Archive of Barometer Bob show from May 2003 with an interview with Joe Sobel and Joe Bastardi from AccuWeather discussing weather modification, privatizing weather and naming winter storms. Listen (55min). Jim interviews Julie Lake, author of "Summer of the Storm", in late April 2003. Her book is about the Galveston Hurricane of 1900 that killed over 6,000 people and the story of a 14 year old girl caught in the hurricane. Listen (27min). In early May of 2003, Jim interviews Robert Mykle, author of "Killer Cane". In 1928, approximately 2,500 people were killed in towns around Lake Okeechobee. In this interview Robert describes the hardships of the people affected. Listen (21min). In October 2002 we had guest J.D. Dutton from Dynostorm on the Barometer Bob show discussing hurricane modification. Listen (25min). 1 year anniversary of 9/11 terrorist attacks with Barometer Bob show live from Pompano Beach, FL home of HurricaneCity. Relive that moment, plus a brief call in from the late Jason Kelley, meteorologist from Panama City, FL. Listen (28min). On October 9th, 2001 Hurricane Iris hits Belize and sinks a dive vessel. We recorded ham radio reports as this was happening. Listen (8min). In September of 1998 Jim Williams & Jeff Gammons intercept Hurricane Georges in Pascagoula, Mississippi. Watch (19min).